My favorite part of Happily Ever After was definitely the illustrations! This is such a pretty book! I checked it out from the library, but I think I will need to buy it to add to my collection -- especially if I can get Kiera to sign it. As far as the stories (lol, of yes -- those too! ), I definitely loved reading the Epilogue and I really enjoyed The Favorite, which I hadn't read before now. I also enjoyed the Departure scene from Celeste's POV. 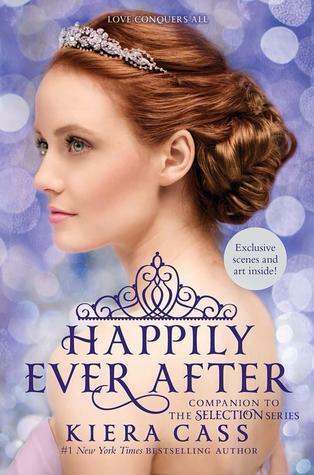 Happily Ever After is a good little dip for fans of the Selection who want to lose themselves in the world again. And, true to the title, it is the perfect completion and goodbye. If you're a fan of the series, I think you will enjoy this collection and should definitely pick it up.